Eat. Live. Laugh. and sometimes shop! : The BEST Day Of My Life. No, The Second Best. Kaden, my darling seven year old son, lost his first tooth last night. That’s right. His first tooth. At age seven. You would probably guess that he was anxious. Excited even. To finally loose a tooth. Everyone has been losing teeth since kindergarten. It is now April of 1st grade. It was time. And the tooth was loose. And I mean very, very loose. As it turns out, Kaden was not at all excited about losing his 1st baby tooth. 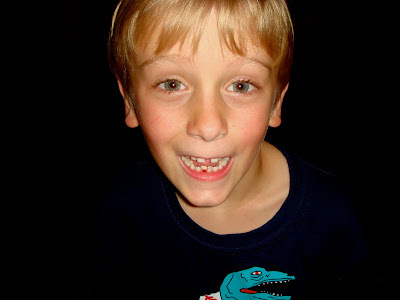 In his words: “I’ve had these teeth since I was a baby; I want to keep them all.” So sentimental at such a young age. I’ve been trying for weeks to pull this tooth. The adult tooth has already come in behind it. We were on borrowed time. Kaden pleaded and begged and cried and begged and pleaded. Just one more day. This, as I mentioned, has been going on for weeks.Last night, however, I got a good hold on it and he (as he generally does as soon as I touch it) yanked his head away from me. This time the force was the proverbial straw that broke the camel’s back or, in this instance, broke the final bond between tooth and boy. The tooth came out. Blood gushing. Kaden crying. I thought this was about to be a horrible moment filled with blood and tears. I thought he would never let me pull out another tooth. And we have so many yet to go. Then through the tears Kaden exclaimed: “This is the BEST day, no second best day of my life!” I bit: ”so what was the best?” His reply: ”The day I was born, of course, if not for that day I wouldn’t be here now.” Indeed. A wise old soul my friend calls him. Sentimental yet joyful. Over a tooth.